Air Bubbles Hi Bob, I wrote to you earlier about pressure I was getting from a new Iwaki pump I installed on my 300 gallon reef tank. That problem was solved. Here is the latest one: It pumps out a copious amount of fine bubbles into the tank. <A very bad situation... as you might know... Please read here: http://www.wetwebmedia.com/bbldisease.htm and the accompanying FAQs file> I checked your FAQs and only found some passing comments about baffling. 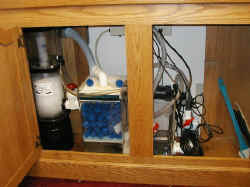 The sump does have bubbles in it from the wet-dry returns, skimmer return, etc. etc. So, what exactly is baffling? 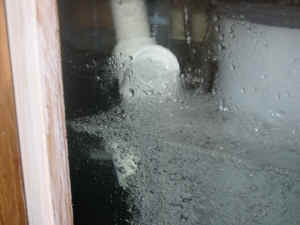 Using glass-glass to separate the pump intake from the bubbles? How would you recommend setting that up? <Better to arrange some open cell polyurethane foam intake area (large as possible, two or more layers better than just one large one... to exclude the bubbles) as your sump is not likely large enough to configure a baffling system that would work... with such a large/flow rate pump... Bob Fenner> Thanks, Dale M.
Re: Air Bubbles OK, I know exactly what you're talking about. In fact, being a collect-a-holic, I have a bunch of it in my garage. I'll wash it out and give it a try. Now, tell me, do I just put these blocks around the pump intake in the sump? <Mmm, no... need to fashion a sort of "support"... a "cage" of more solid material to support the "foam area" above and away from the pump intake...> You said two or more layers are better than just one. Do I just stack this stuff out, up, and over the intake? <Stacked yes... but as I state, a few inches from the actual intake... so as it gets a bit clogged, it doesn't get sucked in, restrict the inflow> You are a god-send. 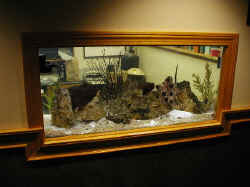 Sometimes, these aquarium issues get mind boggling. <One of the reasons, properties we enjoy... Bob Fenner> Thanks! Dale.